engage with materials designed to foster algebraic habits of mind. 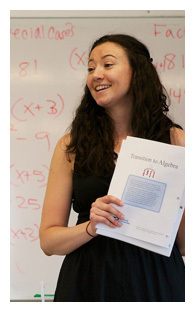 Professional development supports the use of Transition to Algebra. Teachers will learn about the TTA habits of mind approach and the mathematical storyline of the curriculum. Teachers will engage with mathematical activities from the units and discuss student difficulties and share instructional strategies. For more information, please contact us. To learn more about EDC's Mathematical Practices Institute committed to make rigorous mathematics available and interesting to all students while emphasizing the development of serious content knowledge and genuine mathematical habits of mind, please visit mpi.edc.org. To learn more about EDC's teacher resources and professional development curriculum focused on Implementing the Mathematical Practice Standards, please visit mathpractices.edc.org. To learn more about EDC's elementary school K-5 curriculum Think Math!, please visit thinkmath.edc.org. To learn more about EDC's 4-year high school curriculum, CME Project, please visit cmeproject.edc.org. To view images of EDC's iPuzzle app development project, please visit the iPuzzle page. The contents of this website are the results of work supported by the National Science Foundation under Grants No. 0917958 and 1621011. Any opinions, findings, and conclusions or recommendations expressed in this material are those of the author(s) and do not necessarily reflect the views of the National Science Foundation. The text, images, and resources on this website, unless marked otherwise, are developed at EDC (Education Development Center, Inc). EDC owns the copyright © 2011-2018.